Spring and summer brought welcomed change in quail nesting conditions throughout much of the country. As the saying goes; when it rains, it pours. The rains have fallen in overabundance for some, but many states have found refuge from drought stricken habitat in the form of these rain clouds. A significant amount of upland habitat continues to be lost countrywide, and the bleeding has not stopped. The Conservation Reserve Program enrolled only 1.7 million acres in most recent general sign-up, bringing this critical wildlife habitat program down to a 26-year low. However, in the face of this habitat loss, literally thousands of concerned hunter-conservationists have picked up the upland conservation banner and joined Quail Forever as new members and volunteers. This year, Quail Forever reached an all-time “covey” record of more than 11,000 members with new chapters forming from California to Florida. Enjoy these habitat reports and as hunting season approaches, consider lending a hand with your local Quail Forever chapter. Alabama has had an abnormally wet spring/summer, with only a handful of central and southeastern counties experiencing an abnormally dry season – a drastic change from the recent severe summer droughts. Across the state, there’s been anywhere from 17-40” of rainfall reported for the year (as of the end of July) with temperatures remaining relatively low all the way through the summer months. This past winter Alabama Wildlife and Freshwater Fisheries acquired new acreages on several management areas including Lauderdale, Lowndes, Barbour, and James D. Martin Wildlife Management Areas. Additionally, the Forever Wild program bought property that ties into James D. Martin WMA and Lauderdale WMA. It can be said even mediocre quail hunting years in Arizona are better than the best years in other areas of the country. “This year will be one worth getting out and hunting quail, but not one to write the relatives about,” says Johnathan O’Dell, small game biologist for the Arizona Game and Fish Department. According to O’Dell, the state received better amounts of winter rains this year, but it has been a particularly dry spring that started early. However, the summer monsoons did make a timely return. O’Dell also noted quail in southern Arizona started hatching on time, but birds in central Arizona were late. The big three in Arizona (Gambel’s, scaled, and Mearns’ quail) all require precipitation at different times for nesting success. Gambel’s need winter precipitation, scaled spring precipitation, and Mearns’ the summer monsoonal rains. O’Dell also noted spring call counts came in at 20% below last year’s numbers and below the 10-year average. The early, dry spring didn’t help scaled quail due to their typical nesting 2 to 3 weeks behind Gambel’s; however, on the upside, lots of habitat improvements have been made in southeastern Arizona to restore the native grasslands which are important to the scaled quail. Expect to see more Gambel’s quail than scaled quail in those areas this year for a below average season. Mearns’, hunters should be cautiously optimistic. It will take more than 2 good years in a row to bring numbers up, but the state is headed in the right directions. Expect a slightly below average season for Mearns’. Georgia received above average rainfall during late spring and early summer. This has resulted in excellent production of food and nesting cover on most quail managed landscapes. This rainfall doesn’t appear to have resulted in significant reductions in nesting success and brood production, particularly on the more well-drained sandy or loamy soils, says Reggie Thackston, program manager for Georgia Department of Natural Resources. Through the Farm Bill, Georgia has about 200,000 acres in CRP CP3A & CP 36 longleaf pine practices; 2,200 acres in CRP CP 33native field buffers; and 8,000 acres in the CP 38 SAFE Pine Savanna practice. Bobwhites and other grassland species benefit where these practices are appropriately maintained through mid-contract management, such as frequent prescribed fire or rotational winter disking. Additionally, Georgia landowners may be eligible for practice cost share to enhance bobwhite habitat through the Natural Resources Conservation Service’s Working Lands for Wildlife, Environmental Incentives Program and Conservation Stewardship Program. Within all of these programs, landowners may receive funding for practices that can be value added for quail if appropriately applied and maintained in the proper landscape context. Through the Georgia Wildlife Resources Division Private Lands Program, which includes the Bobwhite Quail Initiative, wildlife biologists are available to assist landowners with development of bobwhite management plans and details on habitat practice cost share availability. In recent years in southwest Georgia, approximately 35,000 acres of new and intensively managed wild quail lands have been successfully established on private property through the technical guidance efforts of Tall Timbers Research Station. Georgia WRD is in the process of finalizing the revision of the state’s Bobwhite Quail Initiative under the umbrella of the National Bobwhite Conservation Initiative. This plan targets bobwhite restoration into strategic focal landscapes that often include a mix of both private and public lands. Georgia’s BQI is funded primarily through the sale of a vehicle license plate along with direct donations and grants. Idaho experienced a very mild winter that was drier than average, so overwinter survival is expected to be high, reports Jeff Knetter, upland game and waterfowl staff biologist for Idaho Fish and Game. While overwinter survival may be high, much of southern Idaho has been very dry during the spring/summer nesting season, so there are some concerns regarding brood survival. Unofficial reports have broods being observed thus far, so state biologists remain cautiously optimistic about another good year. In terms of habitat, Idaho has been holding steady at approximately 670,000 acres enrolled in CRP/SAFE and has not seen a significant decline of acres like many other states. Through state and local efforts, Idaho continues to promote the CP-33 buffers practice, as well as a new CRP SAFE practice in western Idaho focused on upland game birds. USDA and the Department of Wildlife are putting effort into promoting mid-contract management which will result in better game bird habitat on these acres. According to Beth Emmerich, agricultural wildlife ecologist with the Missouri Department of Conservation, it appears quail came through the drought of 2012 and the lingering winter of 2012-13 in good shape. “Initial nesting ran a bit later than normal this year due to an extremely cool, wet spring, but early indications are that we are seeing an increase over previous years,” Emmerich says. Nesting and brood-rearing habitat should be in good shape this year after being knocked back by last year’s drought. Quail numbers on the state’s larger grasslands in western and southwest Missouri seem especially good this year. In addition, staff members and cooperators north of the Missouri River also report an increase in calling males and brood observations. Although more rainfall is definitely needed across the core bobwhite range in Texas, enough rainfall events occurred over a large enough area to produce conditions favorable for reproductive efforts. Spring and summer rains occurred in almost every region offering some relief from drought and the following green-up provided bugs and limited nesting cover. “We expect populations to increase compared to last year but remain below the long-term average,” states Robert Perez, upland game bird program leader for the Texas Parks and Wildlife Department. Winter conditions in north Texas did not present any challenges for quail. The region was, however, very dry up until spring and summer when many areas received enough rain to spur male bobwhite calling activity and subsequent nesting activity. Most of the state has experienced long-term drought (2-3 years) and populations have been declining each year of drought; although, there have been some areas of the state that have fared better than others. Texas’ quail roadside surveys are ongoing and preliminary information suggests production is up in many areas of the state. “Utah is home to California and Gambel’s quail populations. Gambel’s quail were in fair condition heading into the breeding season; however, California quail were below average ,” says Jason Robinson, upland game coordinator for the Utah Division of Wildlife Resources. “Early indications are that nesting and brood success have been high,” Robinson says. The winter in Utah was cold and longer than average with snow and cold temps persisting longer than expected, which likely affected California quail populations, but had limited effects on Gambel’s quail. Early spring precipitation was good, especially in May, with June extremely hot and dry, near record dry and hot. July precipitation was higher than average, with average temperatures. The 2013 Quail Habitat Conditions Report was complied by Rehan Nana, Quail Forever public relations specialist, with special thanks given to participating state agencies. I went a bit off the rails buying bird hunting gear over the past year so I am selling some of my excess items. On warm fall days, this lightweight vest will let you cover serious ground in cool comfort. Made of substantial Hammered canvas, it features back mesh insets to enhance airflow in warmer conditions. Two cargo pockets at the side provide handy shell storage, while a rear game bag snaps down for easy cleaning. Lightly padded shooting panels at the shoulder provide great protection against recoil to prevent bruising. Relaxed fit. The DC 40 collar is the "dog half" of the Garmin Astro System. It is the transmitter that relays the dog's position to the handler's Astro 320. The Astro collar gives location updates as often as every five seconds. Astro can track up to ten dogs per "Handheld GPS" receiver at one time. Add additional Astro DC 40s as needed. Innotek Track and Train 1600. Transmitter and collar work well for training but the wire to the beeper portion is broken. If you have repair skills perhaps you can repair. Collar and Controller are "matched" to each other. Since I moved into a house with a yard that isn’t fenced it has been a challenge to effectively condition my dogs so that they are ready for the hunting season. Besides daily walks I added in a couple of other activities to get the dogs in shape. 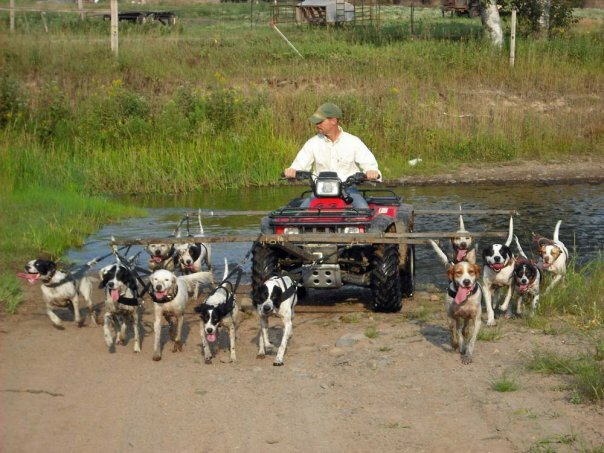 I bought a sled dog harness @ http://www.kondosoutdoors.com/dog-gear in Ely, MN a couple of summers ago and I use it to run the dogs while I am riding my bike. I am able to do this in a park behind our house. This enables me to run the dogs at a faster speed than they will usually run on there own. I use this to work on their aerobic fitness as well as getting them to stretch out their strides. We will do a warmup session and then mix speed work with recovery work. I still am a firm believer in the classic roading to polish up a dog’s fitness. In the years where I haven’t been able to consistently work the dogs on my own I have taken them to a trainer where he will road and / or free run the dogs. An extra advantage to having the trainer do these workouts is that I can also have them layer on any specific skill training that the dogs or I might need some work on. Tina is heading to http://northwoodsbirddogs.com/ on Monday for a couple weeks of roading and free running. Why do I go to all of this trouble to get my dogs into shape before the seasons even start? Because I know that weather / work / family issues will take up a number of the days that I can hunt so I don’t want to miss out on any of the opportunities that I do get to hunt because the dogs aren’t physically prepared to hunt. Also, included in these trainings is getting the human part of the team into shape. It seems that each year it gets more difficult to fit into the hunting pants at the start of the season. I’ve been trying to ride my bike more and to make the dog walks longer so that I can shed some pounds. Tina and I just returned from the vet and she is 4 lbs lighter than at this time last year. A 10% decrease for her and I think that she actually has more muscle also. Pheasants Forever and Quail Forever will take its National Pheasant Fest & Quail Classic event to Milwaukee, Wisconsin for the first time, to run February 14-16, 2014 at the Wisconsin Center. The largest show in the country for upland hunters, bird dog owners and wildlife habitat conservationists, the event drew 28,855 people last February in Minneapolis. National Pheasant Fest & Quail Classic returns to Wisconsin for the first time since 2009, when hunters and conservationists visited the 3-day show at Exhibition Hall at the Alliant Energy Center in Madison. “Pheasants Forever has a strong presence in Wisconsin and the state has a rich conservation tradition, which is why we’re excited to bring our signature event to Milwaukee,” said Howard Vincent, president & CEO of Pheasants Forever and Quail Forever. Vincent adds that Milwaukee is conveniently located near other strong Pheasants Forever and Quail Forever states – Illinois, Minnesota, Iowa, Indiana and Michigan – which will allow members from across the region to enjoy the large annual celebration. Wisconsin is home to 33 Pheasants Forever chapters. In addition to the 790,000 licensed hunters in Wisconsin, the state is second only to Minnesota in sending nonresident upland hunters to the Dakotas – the top two pheasant hunting states – and both South Dakota and North Dakota will be well-represented with exhibitors at the show. “Milwaukee and Wisconsin are thrilled to host the 2014 National Pheasant Fest and Quail Classic. As the largest city in a state with a history of upland hunting and wildlife habitat conservation, Milwaukee is the ideal setting for this prestigious family-friendly national event. Among the city’s major attractions, the world’s only Harley-Davidson Museum is sure to be another draw for visiting attendees,” noted Paul Upchurch, president & CEO of VISIT Milwaukee. National Pheasant Fest & Quail Classic is also the country’s largest event for upland hunters, sport dog owners and wildlife habitat conservationists, combining a national outdoor tradeshow, wildlife habitat seminar series, and family event complete with puppies, tractors, shotguns, and art. The event is open to the public. If you’re interested in exhibiting at Pheasants Forever’s National Pheasant Fest & Quail Classic 2014, contact Brad Heidel, Pheasants Forever and Quail Forever director of corporate sales, at (651) 209-4956 and/or email Brad. For media inquiries, please contact Rehan Nana, Pheasants Forever and Quail Forever public relations specialist, at (651) 209-4973 and/or email Rehan. Pheasants Forever, including its quail conservation division, Quail Forever, is the nation’s largest nonprofit organization dedicated to upland habitat conservation. Pheasants Forever and Quail Forever have more than 135,000 members and 740 local chapters across the United States and Canada. Chapters are empowered to determine how 100 percent of their locally raised conservation funds are spent, the only national conservation organization that operates through this truly grassroots structure. We will be adding more states and dates as the season progresses. Lansing — Hunters throughout the state in pursuit of upland birds and small game can expect another successful season this fall. Upland game birds like ruffed grouse and woodcock should be found in good numbers, and rabbits and squirrels are plentiful. Stewart said grouse drumming counts were down this spring. Using data from 87 routes run in 2012 and 2013, statewide there was a 10.3-percent decrease in the average number of drums heard per route between 2012 (11.8) and 2013 (10.6). The drumming counts were highest in Zone 1 (14.5 drums per route), followed by Zone 2 (9.4) and Zone 3 (6.4). Grouse season runs Sept. 15 to Nov. 14, then re-opens Dec. 1 to Jan. 1. The woodcock season opens Sept. 21 and ends Nov. 3. When hunting woodcock, a Harvest Information Program endorsement is required. The HIP survey takes about a minute to complete and must be added by the agent when you purchase a small-game license. A relatively new tool created by the DNR called, MI-Hunt (www.michigan.gov/mihunt) gives hunters the ability to scout areas ahead of the season by viewing land from aerial photos and learning the habitat online. With 10 million acres of public land in Michigan, it’s not difficult to find areas that hold upland game birds or game animals, according to Stewart. “Bird hunters have found this tool to be very helpful for viewing different forest types, topography, satellite imagery, and road layers – all from the comfort of their own home. There’s even a tutorial designed for grouse hunters,” he said.